Photo courtesy of the artist and Van Abbemuseum. 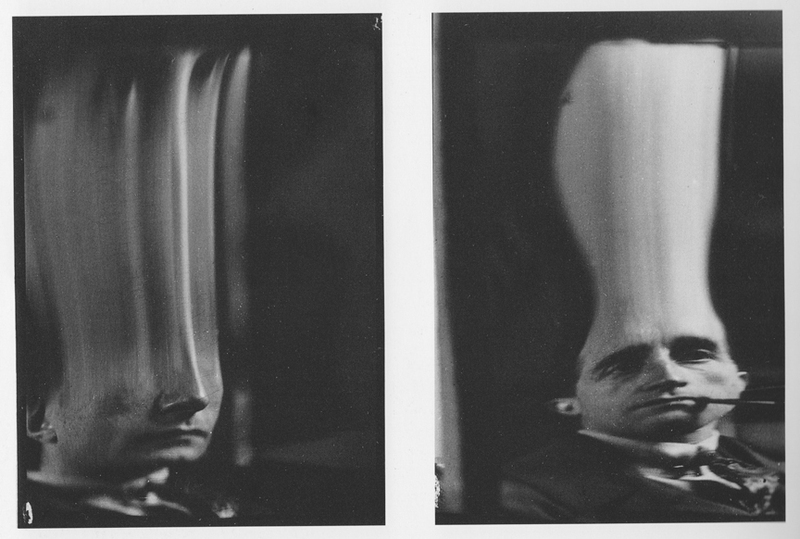 Photo courtesy of the artist, and Van Abbemuseum. 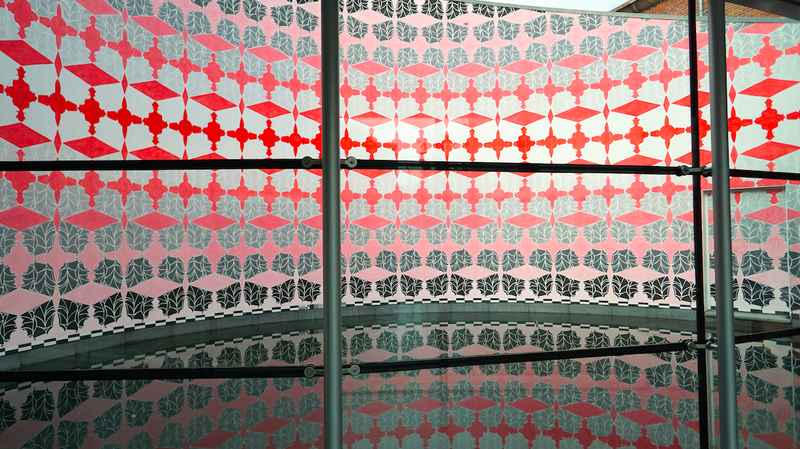 A lattice of diamonds and crosses, painted onto a 21-metre long wall at the Van Abbemuseum in Eindhoven, scatters my gaze. 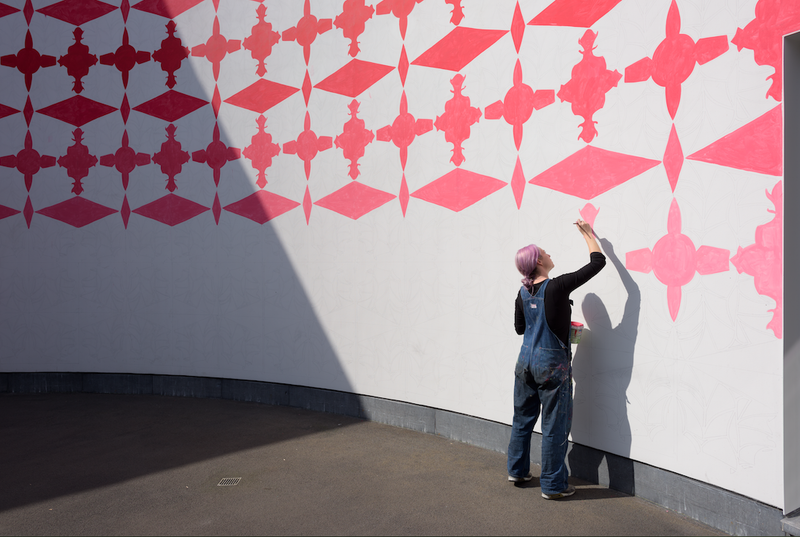 Artist Navine G. Khan-Dossos painted the mural by hand, repeating a motif based on muqarnas – a kind of honeycomb vaulting used in Islamic architecture. 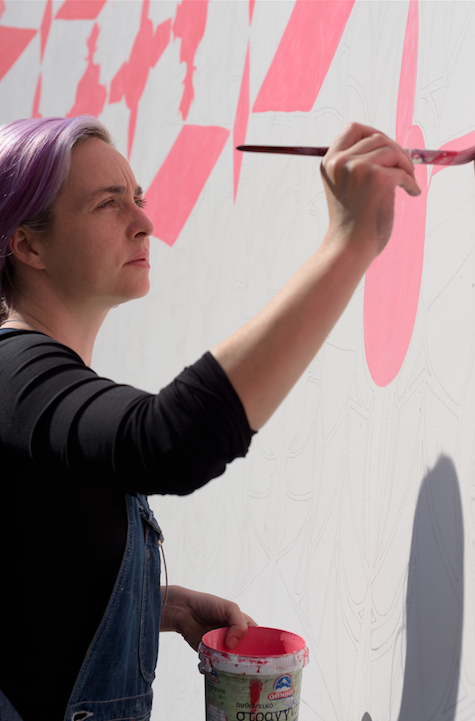 She moved across the wall on a scaffold, first with a cardboard template and later with paint, expanding the mural in careful variations of colour. It shifts from red through to white, heating up at the centre and cooling at the edge, while kite-shaped inner pockets slide through shades of grey, complicating the relationship of flatness and depth. Echo Chamber is a portrait of a woman, although it would be impossible to tell without the accompanying text. The woman in question, Samantha Lewthwaite (also known as Sherafiyah Lewthwaite), is a British Muslim who made headlines following her husband Germaine Lindsey’s involvement in the 7/7 London terrorist attacks in 2005. In the aftermath, Lewthwaite spoke out against his actions, but six years later she was charged by Kenyan police with possession of explosives. She has since been dubbed ‘the White Widow’ by the press, a sensational moniker used for women radicalised at home in the west, who join the ranks of Islamic extremists. Born a year apart, both Khan-Dossos and Lewthwaite are white British women who became influenced by Islam as teenagers. Navine G. Khan-Dossos – an anagram for the artist’s birth name Vanessa Hodgkinson – moved to Kuwait in 2003, and later trained in traditional Islamic art in London. Lewthwaite converted to Islam as a teenager, and married Lindsey in 2002, at the age of 19. Aside from an interview Lewthwaite sold to The Sun in 2005 denouncing her husband’s actions, she has not had much control over the dissemination of her story. Journalists quote from her ‘diary’ – a set of papers seized in Kenya in 2011 – or cite tweets from a Muslim Youth Centre handle @MYC_Press that are rumoured to be hers, but neither are reliable sources. Over the course of the years, Lewthwaite has been transfigured into a stock character in a cultural narrative, one that tells the tale of an English rose who became, by inexplicable conversion, a terrorist. This prefabricated storyline relies on a curious concoction of fantasy and tradition, combining the angel/witch binary with a new strain of Islamophobia that acts of terrorism in the west have been so successful in igniting. The mythos of ‘the White Widow’ sells papers, and since the arrest warrant issued by Kenyan authorities in 2011, Lewthwaite has been accused of a number of felonous and unverifiable activities, including masterminding terrorist activities in East Africa, raising funds for Islamic extremists al-Shabaab through the elephant hunting trade, and undergoing plastic surgery to evade capture. 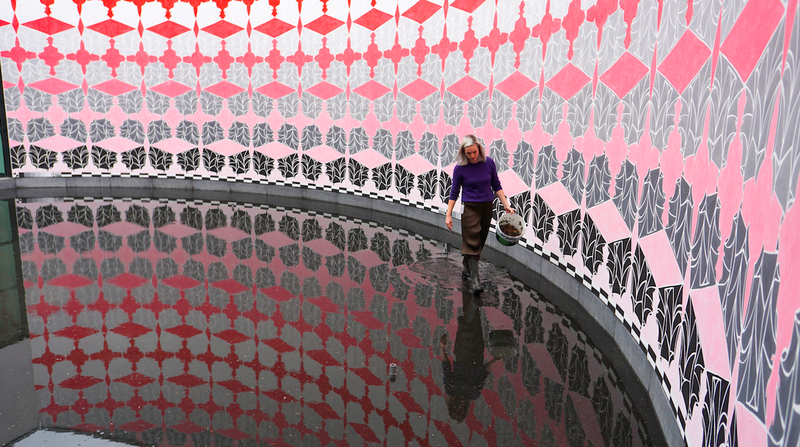 The Van Abbemuseum provides boots you can borrow, and when I visit, I wade through a shallow basin of water beneath the mural, a wrinkled reflection of reds and rippling pinks. Along the bottom rim of the lattice, Khan-Dossos had painted a greyscale ruler, an instrument used to measure forensic evidence. One such ruler can be seen in the photographs of Lewthwaite’s belongings seized by Kenyan police in 2011, and by placing the instrument between the wall and its wobbling reflection, Khan-Dossos suggests the need to re-calibrate our perception of the information at hand, and to attend to distortions. She works in resistance to the handful of selfies and snapshots of Lewthwaite in circulation, which are used in the cheap theatre of clickbait. To do so, she utilises a visual language beyond the realm of sensational journalism: Aniconism. A term that derives from the Greek for ‘anti-image’, Aniconism describes art without idols, a sacred mode of image-making that eschews the human form. It is a tradition that runs deep in Islam, where the flowing lines of the arabesque, or the complex geometries of the murqarnas, are used to represent the divine, a subject understood to be beyond comprehension and to transcend human likeness. 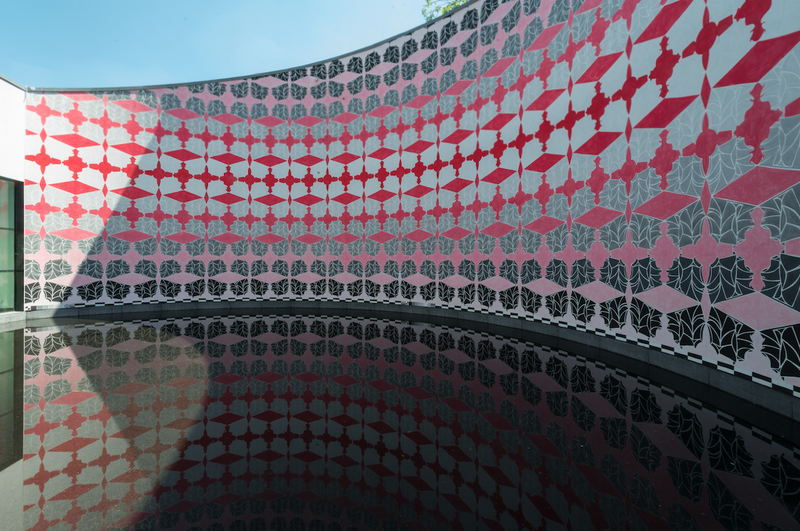 Aniconistic images are encrypted code, and Khan-Dossos teases out a correlation between the geometric forms of sacred Islamic art and the digital realm. In her study Enfoldment and Infinity (2010), Laura U. Marks examines the way new media art is indebted to the Islamic Golden Age, when processes like the algorithm and algebraic geometry were first developed. However, Khan-Dossos’s muqarnas are not sourced from classical designs, as might be expected, but 3D modelling software: a version of ‘Islamic-feel’ muqarnas used in video game architecture. By using such sources, she troubles the genealogy of the design, and plays on the standardised tropes that stand in for Islam in the western imagination. Echo Chamber has fantastic presence, a kind of algorithmic otherworldliness, but the dedicated labour it took to produce is also on show in watery brushstrokes and fine pencil lines. Unlike traditional Aniconism, Khan-Dossos image of Lewthwaite does not court transcendence, but is firmly situated in the corporeal world. There’s a proximity between the artist and her subject, and if anything, Echo Chamber takes a turn towards self-portraiture. autoportrait is shot in the rich silver and greys of 35mm film. Reynolds’s rotating head fills the screen – she does not look into the camera, but her eyelids flutter, tears streak down her cheeks, and her lips move soundlessly. It is an image of tragic, agonised beauty. To emphasise what he considered to be a cheapening of Reynolds’s original video, Thompson sought to invert its qualities: low-res becomes high stock, and testimony is replaced with silence. Solutions, of course, are rarely found in simple binaries, and there is something questionable in this logic. Silencing Reynolds may have stopped her voice from being co-opted, but it also removes the possibility of speech at a time it is sorely needed. In June 2017, in the weeks before the film debuted at the Chisenhale Gallery, Reynolds testified in court. Days later, the officer who shot Castile, Jeronimo Yanez, was cleared of all charges. Khan-Dossos does not attempt to fight images with images, or the poor with the rarified. Instead, she engages another register of image-making entirely, one that exists outside of the echo chamber of media storytelling. 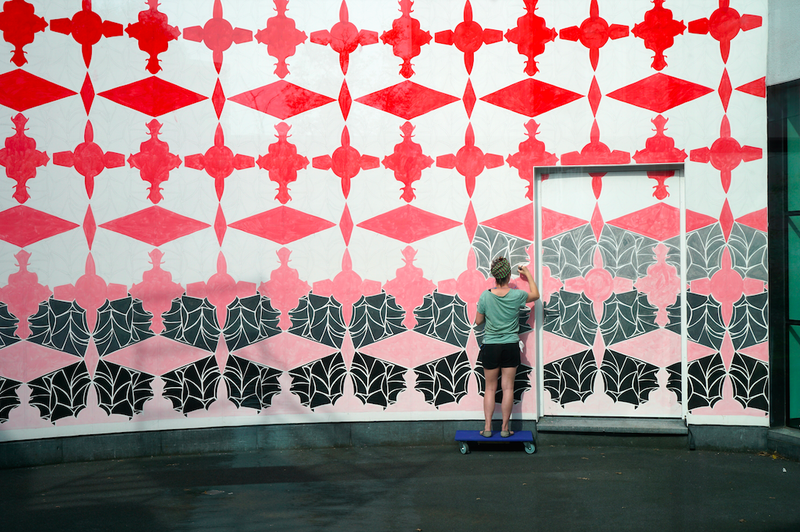 Unlike traditional Aniconism, her mural does not court transcendence. Instead, it asks us to reconsider how we interpret Samantha Lewthwaite, and the visual methods through which her portrait is produced and transmitted. IZABELLA SCOTT is a writer based in London. 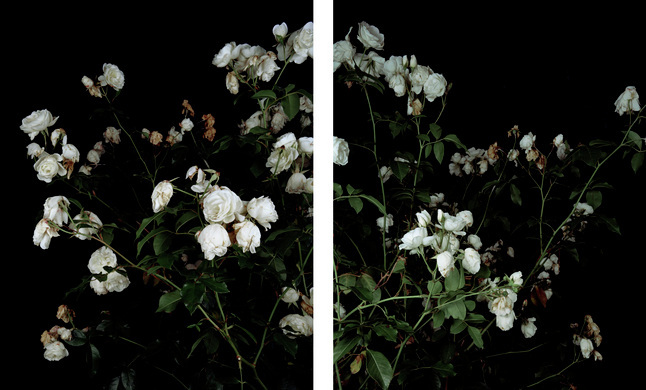 A series of photographs by the acclaimed British artist Sarah Jones is published in The White Review No. 11.